are graded on the 4 value factors. because the Surface is AA. 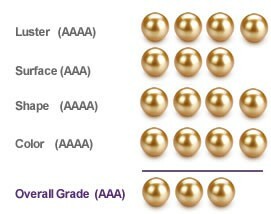 Luster or shine is the indication of how well the pearl reflects the light. A good way to think of luster is like a mirror. It is a very important value factor for the overall grade of the pearls. Pearls grow in various shapes, from baroque to perfectly round, and anywhere in between. The roundness of the pearl can be very small, however those pearls reaching the perfect roundness, also command the most expensive price.